Welcome to the Rawson Group webpage. Please follow the links above to find out about who we are and what we do. Website last updated: 24 Mar 2019. Congratulations to Yassine and Mitch on their recent manuscript "Structural, Magnetic and Optical Studies of the Polymorphic 9′-Anthracenyl Dithiadiazolyl Radical" which has just been accepted for publication in J. Amer. Chem. Soc.! What a great day - the boss survives another year and is taken out for a fantastic lebanese dinner at Mazaars! As a bonus thanks to the American Crystallographic Association for their generous financial support for Dominque and Lara through the Larry Calvert Travel Award program to atend the 10th Canadian Crystallography workshop in Montreal in May. 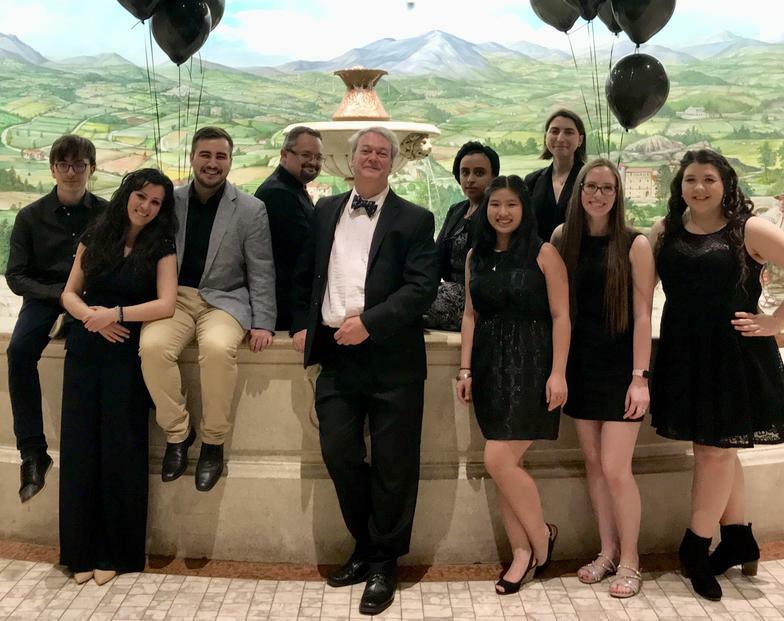 Rawson group scoop prizes in the Faculty of Science Awards (2019)! Congratulations to Nadia as recipient of the 2019 Faculty of Science Student Impact Award (graduate) and to Nathan Doupnik who receives the Faculty of Science Going Above & Beyond in Research Award (undergrad)! Women in Science comes to the new CORe building! The Rawson group's very own Nadia Stephaniuk led the debate with Dr Anne McNeil (U. Michigan) about the challenges facing women in science (left). Another one for Mitch! His review article "1,2,3,5-Dithiadiazolyl Radicals" has been accepted for publication in the Encyclopedia of Inorganic and Bioinorganic Chemistry and provides a summary of key developments in the field of dithiadiazolyl radicals from materials science to crystal engineering and coordination chemistry. 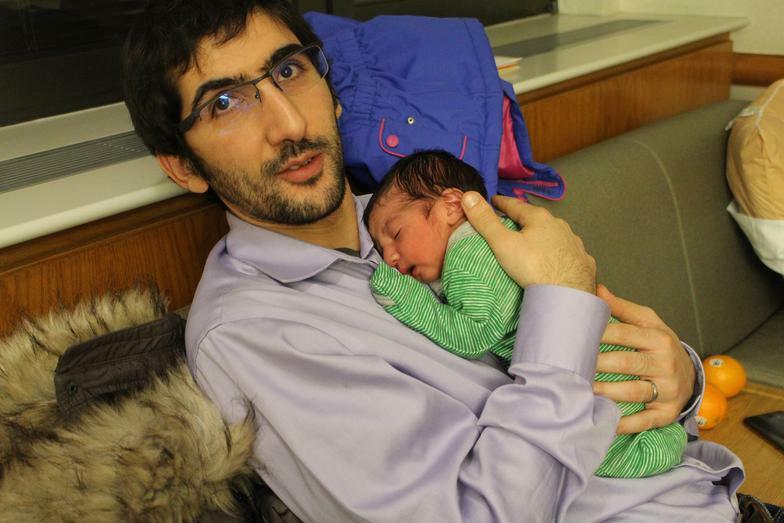 Congratulations to Yassine and Nabila on the recent birth of their son Lyes pictured with Yassine (left). Many congratulations to Mitch on his first author paper which has just been accepted for publication in Angew.Chem (front cover). 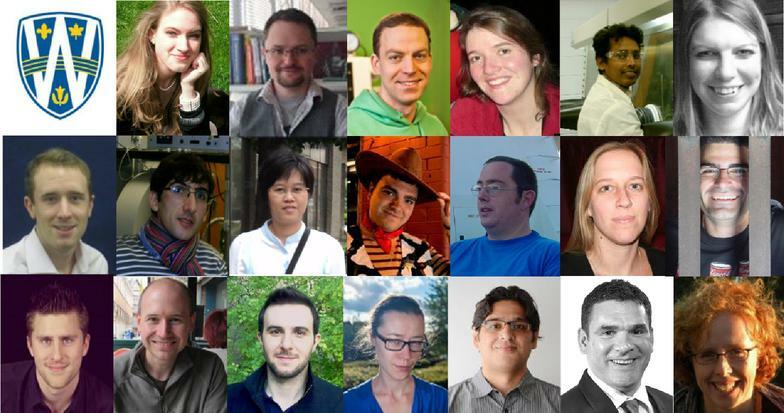 Also to co-authors Elodie, Josh, Hugh, Nadia and Antonio. A link to the accepted article can be found on the publications page. 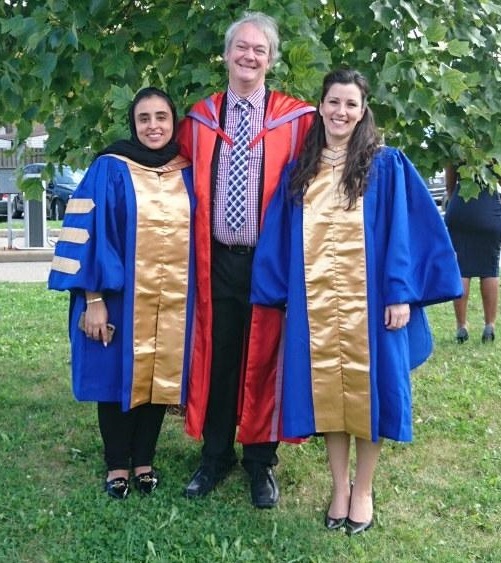 Party all round - congrats to both "Dr Pringouri" and "Dr Alsaleh" on receiving their doctoral degrees. Hooray! Celebrations for Aisha who has successfully defended her PhD thesis. Well done to Konstantina, Usman, Nathan and Yassine on their paper on bis(benzo-thiadiazines) which has been accepted for publication in Dalton Trans. 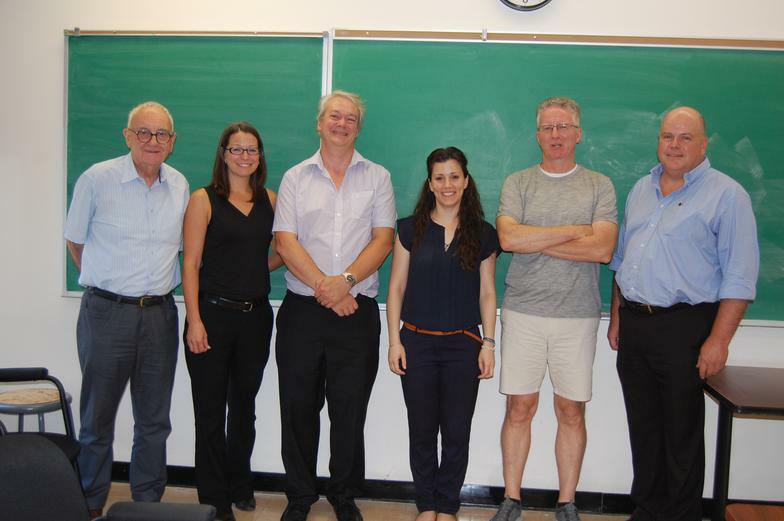 Congratulations to Konstantina on successfully defending her PhD! She is pictured left with her defence committee. Congratulations to Nathan Doupnik for being awarded best undergraduate presentation at CEMWOQ-5 in Montreal for his work on benzothiadiazines. Code Black (left) Time to celebrate the end of term and a successful week! 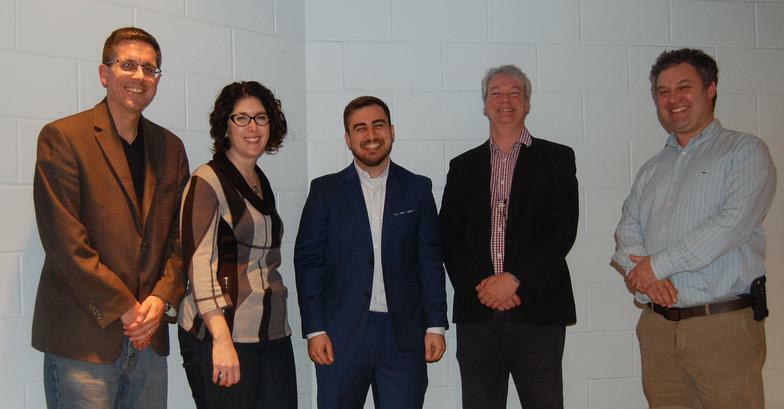 ​Congratulations to Mitch on successfully defending his MSc thesis! Mitch is pictured right with his defence committee. Clearly its publications week - congratulations to Yassine, Mitch, Igor and Christos on their paper on the fluorescent radical, pyrenyl dithiadiazolyl and its fabrication into an OLED and its photo-conducting materials which has been accepted for publication in JACS. Many thanks to Team Aziz at Waterloo for device fabrication and to our Core-to-Core partners in Nagoya for photo-conductivity studies. Congratulations to Konstantina and Usman on their benzothiadiazine paper being accepted into Polyhedron. Welcome to Victor Monnot who has arrived in Windsor from Universite Paris Descartes for his 5 month placement as part of his International Masters program. Well done Nadia and Usman who have both been awarded Canadian National Committee for Crystallography Travel Scholarships to attend the ACA Summer School in Notre Dame. Congratulations to Nathan Doupnik who has been awarded an NSERC USRA to work in the lab this summer on benzothiadiazines. Well done to Konstantina on a successful Departmental presentation of her research and also to Dominique on receiving the University AR and EG Ferris Award! Congratulations to Nadia for winning the Faculty of Science Student Ambassador Award. 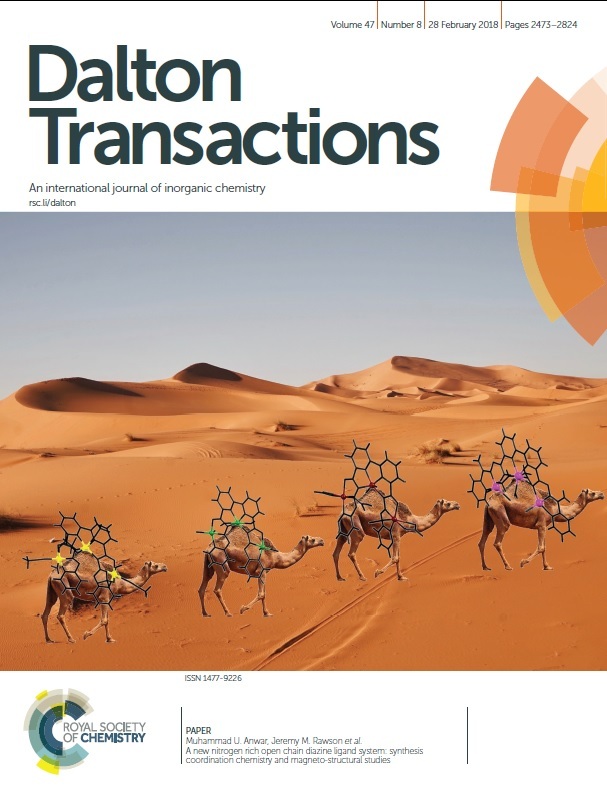 Usman's camels get the hump as inside cover for his latest paper in Dalton Trans.